A two-party system is a party system where two major political parties dominate the government. One of the two parties typically holds a majority in the legislature and is usually referred to as the majority or governing party while the other is the minority or opposition party. Around the world, the term has different senses. For example, in the United States, Jamaica, and Malta, the sense of two-party system describes an arrangement in which all or nearly all elected officials belong to one of the only two major parties, and third parties rarely win any seats in the legislature. In such arrangements, two-party systems are thought to result from various factors like winner-takes-all election rules. In such systems, while chances for third-party candidates winning election to major national office are remote, it is possible for groups within the larger parties, or in opposition to one or both of them, to exert influence on the two major parties. In contrast, in the United Kingdom and Australia and in other parliamentary systems and elsewhere, the term two-party system is sometimes used to indicate an arrangement in which two major parties dominate elections but in which there are viable third parties which do win seats in the legislature, and in which the two major parties exert proportionately greater influence than their percentage of votes would suggest. Explanations for why a country with free elections may evolve into a two-party system have been debated. A leading theory, referred to as Duverger's law, states that two parties are a natural result of a winner-take-all voting system. In countries such as Britain, two major parties emerge which have strong influence and tend to elect most of the candidates, but a multitude of lesser parties exist with varying degrees of influence, and sometimes these lesser parties are able to elect officials who participate in the legislature. In political systems based on the Westminster system, which is a particular style of parliamentary democracy based on the British model and found in many commonwealth countries, a majority party will form the government and the minority party will form the opposition, and coalitions of lesser parties are possible; in the rare circumstance in which neither party is the majority, a hung parliament arises. 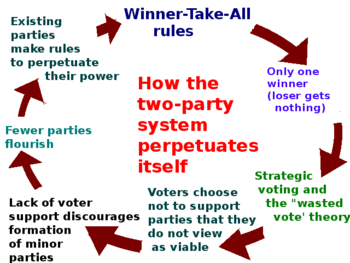 Sometimes these systems are described as two-party systems but they are usually referred to as multi-party systems. There is not always a sharp boundary between a two-party system and a multi-party system. Generally, a two-party system becomes a dichotomous division of the political spectrum with an ostensibly right-wing and left-wing party: the Nationalist Party vs. the Labour Party in Malta, Liberal/National Coalition vs. Labor in Australia, Republicans vs. Democrats in the United States and the Conservative Party vs. the Labour Party in the United Kingdom. Other parties in these countries may have seen candidates elected to local or subnational office, however. Historian John Hicks claims that the United States has never possessed for any considerable period of time the two party system in its pure and undefiled form. In some governments, certain chambers may resemble a two-party system and others a multi-party system. For example, the politics of Australia are largely two-party (the Liberal/National Coalition is often considered a single party at a national level due to their long-standing alliance in forming government and additionally rarely compete for the same seat) for the Australian House of Representatives, which is elected by instant-runoff voting, known within Australia as preferential voting. However, third parties are more common in the Australian Senate, which uses a proportional voting system more amenable to minor parties. In the politics of Canada, while having a multiparty system federally and in the largest provinces of British Columbia, Ontario, Quebec, Manitoba as well as the smaller New Brunswick, Newfoundland And Labrador, Nova Scotia, Prince Edward Island and Yukon Territory many of the provinces have effectively become two-party systems in which only two parties regularly get members elected. Examples include British Columbia (where the battles are between the New Democratic Party and the BC Liberals), Alberta (between the Alberta New Democratic Party and United Conservative Party), Saskatchewan (between the Saskatchewan Party and New Democratic Party), New Brunswick (between the Liberals and the Progressive Conservatives) and Prince Edward Island (between Liberals and Progressive Conservatives). The English speaking countries of the Caribbean while inheriting their basic political system from Great Britain have become two party systems. The politics of Jamaica are between the People's National Party and the Jamaica Labour Party. The politics of Guyana are between the People's Progressive Party and APNU which is actually a coalition of smaller parties. The politics of Trinidad and Tobago are between the People's National Movement and the People's Partnership which is also a coalition. The Politics of Belize are between the United Democratic Party and the People's United Party. The Politics of the Bahamas are between the Progressive Liberal Party and the Free National Movement. The politics of Barbados are between the Democratic Labour Party and the Barbados Labour Party. The politics of Zimbabwe are effectively a two party system between the Robert Mugabe founded Zimbabwe African National Union-Patriotic Front and the opposition coalition Movement for Democratic Change. Most Latin American countries also have presidential systems very similar to the US often with winner takes all systems. Due to the common accumulation of power in the Presidential office both the official party and the main opposition became important political protagonists causing historically two-party systems. Some of the first manifestations of this particularity was with the liberals and conservatives that often fought for power in all Latin America causing the first two-party systems in most Latin American countries which often lead to civil wars in places like Colombia, Ecuador, Mexico, Venezuela, the Central American Republic and Peru, with fights focusing specially on opposing/defending the privileges of the Catholic Church and the creole aristocracy. Other examples of primitive two-party systems included the Pelucones vs Pipiolos in Chile, Federalists vs Unitarians in Argentina, Colorados vs Liberals in Paraguay and Colorados vs Nationals in Uruguay. However, as in other regions, the original rivalry between liberals and conservatives was overtaken by a rivalry between center-left (often social-democratic) parties vs center-right liberal conservative parties, focusing more in economic differences than in cultural and religious differences as it was common during the liberal vs conservative period. Examples of this include National Liberation Party vs Social Christian Unity Party in Costa Rica, the peronista Justicialist Party vs Radical Civic Union in Argentina, Democratic Action vs COPEI in Venezuela, the Colombian Liberal Party (despite the name, a democratic socialist party) vs the Colombian Conservative Party in Colombia, Democratic Revolutionary Party vs Panameñista Party in Panama and Liberal Party vs National Party in Honduras. After the democratization of Central America following the end of the Central American crisis in the 90s former far-left guerrillas and former right-wing authoritarian parties, now in peace, make some similar two-party systems in countries like Nicaragua between the Sandinista National Liberation Front and the Liberals and in El Salvador between the Farabundo Martí National Liberation Front and the Nationalist Republican Alliance. The traditional two-party dynamic started to break after a while, especially in early 2000s; alternative parties won elections breaking the traditional two-party systems including Rafael Caldera's (National Convergence) victory in Venezuela in 1993, Álvaro Uribe (Colombia First) victory in 2002, Tabaré Vázquez (Broad Front) victory in Uruguay in 2004, Ricardo Martinelli (Democratic Change) victory in 2009 in Panama, Luis Guillermo Solís (Citizens' Action Party ) victory in 2014 in Costa Rica, Mauricio Macri (Republican Proposal) victory in 2015 in Argentina and Nayib Bukele (Grand Alliance for National Unity) victory in 2019 in El Salvador, all of them from non-traditional third parties in their respective countries. In some countries like Chile and Venezuela the political system is now split in two large multy-party alliances or blocs, one on the left and one on the right of the spectrum (Concertación/New Majority vs Alliance in Chile, Democratic Unity Roundtable vs Great Patriotic Pole in Venezuela). Malta is somewhat unusual in that while the electoral system is single transferable vote (STV), traditionally associated with proportional representation, minor parties have not earned much success. Politics is dominated between the centre-left Labour Party and the centre-right Nationalist Party, with no third parties winning seats in Parliament between 1962 and 2017. There is general agreement that the United States has a two-party system; historically, there have been few instances in which third party candidates won an election. In the First Party System, only Alexander Hamilton's Federalist Party and Thomas Jefferson's Democratic-Republican Party were significant political parties. Toward the end of the First Party System, the Republicans dominated a one-party system (primarily under the Presidency of James Monroe). Under the Second Party System, the Democratic-Republican Party split during the election of 1824 into Adams' Men and Jackson's Men. In 1828, the modern Democratic Party formed in support of Andrew Jackson. The National Republicans were formed in support of John Quincy Adams. After the National Republicans collapsed, the Whig Party and the Free Soil Party quickly formed and collapsed. In 1854, the modern Republican Party formed from a loose coalition of former Whigs, Free Soilers and other anti-slavery activists. Abraham Lincoln became the first Republican president in 1860. During the Third Party System, the Republican Party was the dominant political faction, but the Democrats held a strong, loyal coalition in the Solid South. During the Fourth Party System, the Republicans remained the dominant Presidential party, although Democrats Grover Cleveland and Woodrow Wilson were both elected to two terms. In 1932, at the onset of the Fifth Party System, Democrats took firm control of national politics with the landslide victories of Franklin D. Roosevelt in four consecutive elections. Other than the two terms of Republican Dwight Eisenhower from 1953 to 1961, Democrats retained firm control of the Presidency until the mid-1960s. Since the mid-1960s, despite a number of landslides (such as Richard Nixon carrying 49 states and 61% of the popular vote over George McGovern in 1972; Ronald Reagan carrying 49 states and 58% of the popular vote over Walter Mondale in 1984), Presidential elections have been competitive between the predominant Republican and Democratic parties and no one party has been able to hold the Presidency for more than three consecutive terms. In the election of 2012, only 4% separated the popular vote between Barack Obama (51%) and Mitt Romney (47%), although Obama won the electoral vote by a landslide (332–206). Throughout every American party system, no third party has won a Presidential election or majorities in either house of Congress. Despite that, third parties and third party candidates have gained traction and support. In the election of 1912, Theodore Roosevelt won 27% of the popular vote and 88 electoral votes running as a Progressive. In the 1992 Presidential election, Ross Perot won 19% of the popular vote but no electoral votes running as an Independent. South Korea has a multi-party system that has sometimes been described as having characteristics of a two-party system. Furthermore, the Lebanese Parliament is mainly made up of two bipartisan alliances. Although both alliances are made up of several political parties on both ends of the political spectrum the two way political situation has mainly arisen due to strong ideological differences in the electorate. Once again this can mainly be attributed to the winner takes all thesis. Historically, Brazil had a two-party system for most of its military dictatorship (1964–1985): the military junta banned all existing parties when it took power and created a pro-government party, the National Renewal Alliance and an official opposition party, the Brazilian Democratic Movement. The two parties were dissolved in 1979, when the regime allowed other parties to form. A report in The Christian Science Monitor in 2008 suggested that Spain was moving towards a "greater two-party system" while acknowledging that Spain has "many small parties". However a 2015 article published by WashingtonPost.com written by academic Fernando Casal Bértoa noted the decline in support for the two main parties, the People's Party (PP) and the Spanish Socialist Workers' Party (PSOE) in recent years, with these two parties winning only 52 percent of the votes in that year's regional and local elections. He explained this as being due to the Spanish economic crisis, a series of political corruption scandals and broken campaign promises. He argued that the emergence of the new Citizens and Podemos parties would mean the political system would evolve into a two-bloc system, with an alliance of the PP and Citizens on the right facing a leftist coalition of PSOE, Podemos and the United Left. Multi-party systems. In these, the effective number of parties is greater than two but usually fewer than five; in a two-party system, the effective number of parties is two (according to one analysis, the actual average number of parties varies between 1.7 and 2.1.) The parties in a multi-party system can control government separately or as a coalition; in a two-party system, however, coalition governments rarely form. Examples of nations with multi-party systems include Brazil, Canada, Denmark, Finland, France, Germany, India, Pakistan, Indonesia, Ireland, Israel, Italy, Mexico, Nepal, the Netherlands, New Zealand, Norway, Portugal, Russia, Spain, Sweden and Taiwan. One-party systems or dominant-party systems happen in nations where no more than one party is codified in law and/or officially recognized, or where alternate parties are restricted by the dominant party which wields power. Examples include rule by the Communist Party of China and the People's Action Party of Singapore. There are several reasons why, in some systems, two major parties dominate the political landscape. There has been speculation that a two-party system arose in the United States from early political battling between the federalists and anti-federalists in the first few decades after the ratification of the Constitution, according to several views. In addition, there has been more speculation that the winner-takes-all electoral system as well as particular state and federal laws regarding voting procedures helped to cause a two-party system. In a two-party system, voters have mostly two options; in this sample ballot for an election in Summit, New Jersey, voters can choose between a Republican or Democrat, but there are no third party candidates. The main reason for America's majoritarian character is the electoral system for Congress. Members of Congress are elected in single-member districts according to the "first-past-the-post" (FPTP) principle, meaning that the candidate with the plurality of votes is the winner of the congressional seat. The losing party or parties win no representation at all. The first-past-the-post election tends to produce a small number of major parties, perhaps just two, a principle known in political science as Duverger's Law. Smaller parties are trampled in first-past-the-post elections. Because even a minor party may still obtain at least a few seats in the legislature, smaller parties have a greater incentive to organize under such electoral systems than they do in the United States. In contrast, a voting system that allows only a single winner for each possible legislative seat is sometimes termed a plurality voting system or single-winner voting system and is usually described under the heading of a winner-takes-all arrangement. Each voter can cast a single vote for any candidate within any given legislative district, but the candidate with the most votes wins the seat, although variants, such as requiring a majority, are sometimes used. What happens is that in a general election, a party that consistently comes in third in every district is unlikely to win any legislative seats even if there is a significant proportion of the electorate favoring its positions. This arrangement strongly favors large and well–organized political parties that are able to appeal to voters in many districts and hence win many seats, and discourages smaller or regional parties. Politically oriented people consider their only realistic way to capture political power is to run under the auspices of the two dominant parties. In the U.S., forty-eight states have a standard winner-takes-all electoral system for amassing presidential votes in the Electoral College system. The winner-takes-all principle applies in presidential elections, since if a presidential candidate gets the most votes in any particular state, all of the electoral votes from that state are awarded. In all but two states, Maine and Nebraska, the presidential candidate winning a plurality of votes wins all of the electoral votes, a practice called the unit rule. Duverger concluded that "plurality election single-ballot procedures are likely to produce two-party systems, whereas proportional representation and runoff designs encourage multipartyism." He suggested there were two reasons why winner-takes-all systems leads to a two-party system. First, the weaker parties are pressured to form an alliance, sometimes called a fusion, to try to become big enough to challenge a large dominant party and, in so doing, gain political clout in the legislature. Second, voters learn, over time, not to vote for candidates outside of one of the two large parties since their votes for third party candidates are usually ineffectual. As a result, weaker parties are eliminated by voters over time. Duverger pointed to statistics and tactics to suggest that voters tended to gravitate towards one of the two main parties, a phenomenon which he called polarization, and tend to shun third parties. For example, some analysts suggest that the Electoral College system in the United States, by favoring a system of winner-takes-all in presidential elections, is a structural choice favoring only two major parties. The bounty of the American economy, the fluidity of American society, the remarkable unity of the American people, and, most important, the success of the American experiment have all mitigated against the emergence of large dissenting groups that would seek satisfaction of their special needs through the formation of political parties. An effort in 2012 by centrist groups to promote ballot access by Third Party candidates called Americans Elect spent $15 million to get ballot access but failed to elect any candidates. The lack of choice in a two-party model in politics has often been compared to the variety of choices in the marketplace. Politics has lagged our social and business evolution ... There are 30 brands of Pringles in our local grocery store. How is it that Americans have so much selection for potato chips and only two brands—and not very good ones—for political parties? According to one view, the winner-takes-all system discourages voters from choosing third party or independent candidates, and over time the process becomes entrenched so that only two major parties become viable. Third parties, meaning a party other than one of the two dominant parties, are possible in two-party systems, but they are often unlikely to exert much influence by gaining control of legislatures or by winning elections. While there are occasional opinions in the media expressed about the possibility of third parties emerging in the United States, for example, political insiders such as the 1980 presidential candidate John Anderson think the chances of one appearing in the early twenty-first century is remote. A report in The Guardian suggested that American politics has been "stuck in a two-way fight between Republicans and Democrats" since the Civil War, and that third-party runs had little meaningful success. Focused on a charismatic individual. When third parties are built around an ideology which is at odds with the majority mindset, many members belong to such a party not for the purpose of expecting electoral success but rather for personal or psychological reasons. In the U.S., third parties include older ones such as the Libertarian Party and the Green Party and newer ones such as the Pirate Party. Many believe that third parties don't affect American politics by winning elections, but they can act as "spoilers" by taking votes from one of the two major parties. They act like barometers of change in the political mood since they push the major parties to consider their demands. An analysis in New York Magazine by Ryan Lizza in 2006 suggested that third parties arose from time to time in the nineteenth century around single-issue movements such as abolition, women's suffrage, and the direct election of senators, but were less prominent in the twentieth century. A so-called third party in the United Kingdom are the Liberal Democrats. In the 2010 election, the Liberal Democrats received 23% of the votes but only 9% of the seats in the House of Commons. While electoral results do not necessarily translate into legislative seats, the Liberal Democrats can exert influence if there is a situation such as a hung parliament. In this instance, neither of the two main parties (at present, the Conservative Party and the Labour Party) have sufficient authority to run the government. Accordingly, the Liberal Democrats can in theory exert tremendous influence in such a situation since they can ally with one of the two main parties to form a coalition. This happened in the Coalition government of 2010. Yet in that more than 13% of the seats in the British House of Commons are held in 2011 by representatives of political parties other than the two leading political parties of that nation, contemporary Britain is considered by some to be a multi-party system, and not a two-party system. The two party system in the United Kingdom allows for other parties to exist, although the main two parties tend to dominate politics; in this arrangement, other parties are not excluded and can win seats in Parliament. In contrast, the two party system in the United States has been described as a duopoly or an enforced two-party system, such that politics is almost entirely dominated by either the Republicans or Democrats, and third parties rarely win seats in Congress. Some historians have suggested that two-party systems promote centrism and encourage political parties to find common positions which appeal to wide swaths of the electorate. It can lead to political stability[not in citation given] which leads, in turn, to economic growth. Historian Patrick Allitt of the Teaching Company suggested that it is difficult to overestimate the long term economic benefits of political stability. Sometimes two-party systems have been seen as preferable to multi-party systems because they are simpler to govern, with less fractiousness and greater harmony, since it discourages radical minor parties, while multi-party systems can sometimes lead to hung parliaments. Italy, with a multi-party system, has had years of divisive politics since 2000, although analyst Silvia Aloisi suggested in 2008 that the nation may be moving closer to a two-party arrangement. The two-party has been identified as simpler since there are fewer voting choices. One analyst suggested the two-party system, in contrast with proportional representation, prevented excessive government interference with economic policy. Herein lies the central tension of the two–party doctrine. It identifies popular sovereignty with choice, and then limits choice to one party or the other. If there is any truth to Schattschneider's analogy between elections and markets, America's faith in the two–party system begs the following question: Why do voters accept as the ultimate in political freedom a binary option they would surely protest as consumers? ... This is the tyranny of the two–party system, the construct that persuades United States citizens to accept two–party contests as a condition of electoral democracy. There have been arguments that the winner-take-all mechanism discourages independent or third-party candidates from running for office or promulgating their views. Ross Perot's former campaign manager wrote that the problem with having only two parties is that the nation loses "the ability for things to bubble up from the body politic and give voice to things that aren't being voiced by the major parties." One analyst suggested that parliamentary systems, which typically are multi-party in nature, lead to a better "centralization of policy expertise" in government. Multi-party governments permit wider and more diverse viewpoints in government, and encourage dominant parties to make deals with weaker parties to form winning coalitions. Analyst Chris Weigant of the Huffington Post wrote that "the parliamentary system is inherently much more open to minority parties getting much better representation than third parties do in the American system". After an election in which the party changes, there can be a "polar shift in policy-making" when voters react to changes. Political analyst A. G. Roderick, writing in his book Two Tyrants, argued that the two American parties, the Republicans and Democrats, are highly unpopular in 2015, and are not part of the political framework of state governments, and do not represent 47% of the electorate who identify themselves as "independents". He makes a case that the American president should be elected on a non-partisan basis, and asserts that both political parties are "cut from the same cloth of corruption and corporate influence." The two-party system, in the sense of the looser definition, where two parties dominate politics but in which third parties can elect members and gain some representation in the legislature, can be traced to the development of political parties in the United Kingdom. There was a division in English politics at the time of the Civil War and Glorious Revolution in the late 17th century. The Whigs supported Protestant constitutional monarchy against absolute rule and the Tories, originating in the Royalist (or "Cavalier") faction of the English Civil War, were conservative royalist supporters of a strong monarchy as a counterbalance to the republican tendencies of Parliament. In the following century, the Whig party's support base widened to include emerging industrial interests and wealthy merchants. The basic matters of principle that defined the struggle between the two factions, were concerning the nature of constitutional monarchy, the desirability of a Catholic king,[page needed] the extension of religious toleration to nonconformist Protestants, and other issues that had been put on the liberal agenda through the political concepts propounded by John Locke, Algernon Sidney and others. 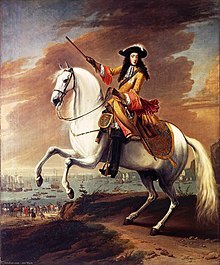 Vigorous struggle between the two factions characterised the period from the Glorious Revolution to the 1715 Hanoverian succession, over the legacy of the overthrow of the Stuart dynasty and the nature of the new constitutional state. This proto two-party system fell into relative abeyance after the accession to the throne of George I and the consequent period of Whig supremacy under Robert Walpole, during which the Tories were systematically purged from high positions in government. However, although the Tories were dismissed from office for half a century, they still retained a measure of party cohesion under William Wyndham and acted as a united, though unavailing, opposition to Whig corruption and scandals. At times they cooperated with the "Opposition Whigs", Whigs who were in opposition to the Whig government; however, the ideological gap between the Tories and the Opposition Whigs prevented them from coalescing as a single party. The old Whig leadership dissolved in the 1760s into a decade of factional chaos with distinct "Grenvillite", "Bedfordite", "Rockinghamite", and "Chathamite" factions successively in power, and all referring to themselves as "Whigs". Out of this chaos, the first distinctive parties emerged. The first such party was the Rockingham Whigs under the leadership of Charles Watson-Wentworth and the intellectual guidance of the political philosopher Edmund Burke. Burke laid out a philosophy that described the basic framework of the political party as "a body of men united for promoting by their joint endeavours the national interest, upon some particular principle in which they are all agreed". As opposed to the instability of the earlier factions, which were often tied to a particular leader and could disintegrate if removed from power, the two party system was centred on a set of core principles held by both sides and that allowed the party out of power to remain as the Loyal Opposition to the governing party. In A Block for the Wigs (1783), James Gillray caricatured Fox's return to power in a coalition with North[clarify]. George III is the blockhead in the center. A genuine two-party system began to emerge, with the accession to power of William Pitt the Younger in 1783 leading the new Tories, against a reconstituted "Whig" party led by the radical politician Charles James Fox. The two party system matured in the early 19th century era of political reform, when the franchise was widened and politics entered into the basic divide between conservatism and liberalism that has fundamentally endured up to the present. The modern Conservative Party was created out of the "Pittite" Tories by Robert Peel, who issued the Tamworth Manifesto in 1834 which set out the basic principles of Conservatism; - the necessity in specific cases of reform in order to survive, but an opposition to unnecessary change, that could lead to "a perpetual vortex of agitation". Meanwhile, the Whigs, along with free trade Tory followers of Robert Peel, and independent Radicals, formed the Liberal Party under Lord Palmerston in 1859, and transformed into a party of the growing urban middle-class, under the long leadership of William Ewart Gladstone. The two party system had come of age at the time of Gladstone and his Conservative rival Benjamin Disraeli after the 1867 Reform Act. Although the Founding Fathers of the United States did not originally intend for American politics to be partisan, early political controversies in the 1790s saw the emergence of a two-party political system, the Federalist Party and the Democratic-Republican Party, centred on the differing views on federal government powers of Secretary of the Treasury Alexander Hamilton and James Madison. However, a consensus reached on these issues ended party politics in 1816 for a decade, a period commonly known as the Era of Good Feelings. Partisan politics revived in 1829 with the split of the Democratic-Republican Party into the Jacksonian Democrats led by Andrew Jackson, and the Whig Party, led by Henry Clay. The former evolved into the modern Democratic Party and the latter was replaced with the Republican Party as one of the two main parties in the 1850s. ^ a b c d e f g h i j k l Schmidt, Steffen W.; Shelley, Mack C.; Bardes, Barbara A (2008). "American Government and Politics Today 2008–2009". Wadsworth Publishing Company. Retrieved 2010-11-22. ^ Disch, Lisa Jane (2002). The Tyranny of the Two-Party System - Lisa Jane Disch - Google Books. ISBN 9780231110358. Retrieved 2012-10-29. ^ "United Progressive Alliance (UPA)". electionaffairs.com. Archived from the original on 2012-02-05. ^ "National Democratic Alliance (NDA)". electionaffairs.com. ^ "Political Parties in India". electionaffairs.com. Archived from the original on 7 July 2015. Retrieved 7 August 2012. ^ Coppedge, Michael. "The Dynamic Diversity of Latin American Party Systems". Kellogg Institute, Hesburgh Center. ^ a b Moreira, Constanza (2006). "Party systems, political alternation and ideology in the south cone (Argentina, Brazil, Chile and Uruguay)". Revista Uruguaya de Ciencia Política. 2 (SE). Retrieved 24 January 2018. ^ a b Angell, Alan (July 1966). "PARTY SYSTEMS IN LATIN AMERICA". Political Quartely. 37 (3): 309–323. doi:10.1111/j.1467-923X.1966.tb00224.x. ^ Borg, Bertrand (6 June 2017). "Marlene Farrugia's election met with counting hall taunts". Times of Malta. Retrieved 9 June 2017. Malta's next legislature will feature an elected third party representative for the first time in more than 50 years, with Democratic Party leader Marlene Farrugia having made it into parliament. ^ Jung Sang-Geun (July 10, 2013). "'그들만의 양당제', 유권자가 정치에 관심을 끊은 이유". Mediatoday. Retrieved 2013-10-18. ^ "The Lebanese crisis explained". 2007-05-22. ^ Martins, Luciano; Schneider, Ronald Milton. "Brazil - Political parties". britannica.com. Retrieved 23 September 2017. ^ Robert Marquand (March 11, 2008). "In Spain's elections, Socialists win with liberal appeal". Christian Science Monitor. Retrieved 2010-11-07. The outcome also suggests that Spain, which has many small parties, is moving toward a greater two-party system – even as basic splits between right and left are deepening and becoming more contentious. ^ Casal Bértoa, Fernando (19 June 2015). "Shake-up in Spain: Reform parties have broken the old two-party cartel". WashingtonPost.com. Retrieved 23 September 2017. ^ Lijphart, Arend; Lijphart, Professor of Political Science Arend; Aitkin, Don (1994). Electoral Systems and Party Systems: A Study of Twenty-Seven Democracies ... - Arend Lijphart - Google Books. ISBN 9780198273479. Retrieved 2012-10-29. ^ a b c Edwards III, George C. (2011). Why the Electoral College is Bad for America (Second ed.). New Haven and London: Yale University Press. pp. 176–7. ISBN 978-0-300-16649-1. ^ Sachs, Jeffrey (2011). The Price of Civilization. New York: Random House. p. 107. ISBN 978-1-4000-6841-8. ^ Kristina dell (Nov 1, 2004). "The Electoral College Explained". Time Magazine. Retrieved 2010-11-07. Forty-eight states have the standard "winner-takes-all" electoral system: whichever presidential ticket amasses the most popular votes in a state wins all the electors of that state. ^ Kristina dell (Nov 1, 2004). "The Electoral College Explained". Time Magazine. Retrieved 2010-11-07. ^ Michael Crowley, May 21, 2012, Time Magazine, Indie Block: Why has a third-party presidential effort sputtered?, Accessed Aug. 11, 2013, "...and another $15 million has gone toward its most valuable asset: ballot access. Americans Elect has secured a ballot line in 26 states.."
^ a b c Ryan Lizza (Apr 16, 2006). "But Is a Third Party Possible?". New York Magazine. Retrieved 2010-12-07. ^ Paul Harris (19 November 2011). "'America is better than this': paralysis at the top leaves voters desperate for change". The Guardian. Retrieved 2012-01-17. ^ Jack Schofield (8 June 2009). "Sweden's Pirate Party wins EU seat (updated)". The Guardian. Retrieved 2011-03-28. The Pirate Party ... wants to legalise internet file-sharing and protect people's privacy on the net ... There *IS* a UK Pirate Party ... and there's a US ... one, and one in a few dozen others." ^ Ryan Lizza (Apr 16, 2006). "But Is a Third Party Possible?". New York Magazine. Retrieved 2010-12-07. In the nineteenth century, third parties were single-issue creatures that grew up around great causes that the major parties were ignoring. Abolition, women’s suffrage, and the direct election of senators all started as third-party movements. ^ United Kingdom general election, 2010#Results, The detailed "Results" section of the Wikipedia article "United Kingdom General Election, 2010". ^ Gillespie, J. D. (2012). Challengers to Duopoly: Why Third Parties Matter in American Two-party Politics. University of South Carolina Press. ^ Lisa Jane Disch (2002). "The tyranny of the two-party system". Columbia University Press. Retrieved 2010-10-22. ^ Kristina dell (Nov 1, 2004). "The Electoral College Explained". Time Magazine. Retrieved 2010-11-07. Some argue that the winner-take-all mechanism in 48 states discourages independent or third party candidates from running because it would be difficult for them to get many electoral votes. ^ "The advantages of parliamentarianism". The Economist. Jan 21, 2010. Retrieved 2010-11-07. ^ A.G.Roderick (Oct 17, 2014). Two Tyrants. City of Gold Publishing. ISBN 978-0990889205. Retrieved 2016-04-23. ^ J. R. Jones, The First Whigs. The Politics of the Exclusion Crisis. 1678–1683 (Oxford University Press, 1961), p. 4. ^ Hamowy, Ronald, ed. (2008). "The Encyclopedia of Libertarianism". The Encyclopedia of Libertarianism. Thousand Oaks, CA: SAGE Publications, Cato Institute. ISBN 978-1-4129-6580-4. LCCN 2008009151. OCLC 750831024. ^ Robert Lloyd Kelley (1990). The Transatlantic Persuasion: The Liberal-Democratic Mind in the Age of Gladstone. Transaction Publishers. p. 83. ISBN 9781412840293. ^ "ConHome op-ed: the USA, Radical Conservatism and Edmund Burke". ^ Frank O'Gorman (1982). The Emergence of the British Two-Party System, 1760 - 1832. Holmes & Meier Publishers, Incorporated. ^ "The History of Political Parties in England (1678-1914)". ^ Stephen J. Lee (2005). Gladstone and Disraeli. Routledge. p. 146. ISBN 9781134349272. Look up two-party system in Wiktionary, the free dictionary. This page was last edited on 11 March 2019, at 08:24 (UTC).